Laurinat, Ernst Erich, 84, of Beach Meadows, Queens County, passed away peacefully on Sunday, March 23rd, 2014, in Queens General Hospital, Liverpool, Nova Scotia. Born in Berlin, Germany, he was the son of the late Erna Laurinat. Ernst immigrated to Canada in 1956. He was first employed at DeHavilland Aircraft, in Toronto. After relocating to Nova Scotia, he worked at Major Vending in Dartmouth, before finally moving to Beach Meadows, where he drove bus for the Community College. Later he was employed as a custodian/ supervisor at the former Liverpool Regional High School until he retired in 1994. He loved music and played in the Bowater Mersey Band. 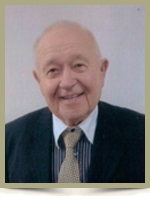 Ernst was an active Jehovah’s Witness for 47 years. He is survived by his loving wife, Ruth; sons Bernd (Peggy), of Orillia, Robert (Paula), of Dartmouth; daughters Ellen (Colin) Harding, of Ottawa, Ontario, Ingrid (Paul) Cote, of Severn Bridge, Ontario, Janette (F. Reinhard) Tielsch, of Liverpool; fourteen grandchildren; many great-grandchildren and great-great-grandchildren. He was predeceased by a grandson Timothy Oickle. We were so sorry to read of Ernie’s passing. Such a kind, gentle man he was. We always enjoyed the times spent with you. You are in our thoughts and prayers at this most difficult time. I am so sorry to read of Ernie`s passing. My deepest sympathy to you and your family.He will be greatly missed and may you all find peace in knowing he is with God.. I was very sorry to hear of Ernie’s passing from a former schoolmate earlier this morning. Ernie was a fine gentleman with a great sense of humour , especially when he was in the Mersey Band. He will be greatly missed by everyone who knew him. You are in my thoughts and prayers. Ruth and family: We were sorry to hear about Ernie. Our thoughts and our prayers are with your family. Janette and Family: Sorry to hear of your fathers passing.Sincere condolence is extended to you and your family. We met Ernie when he had his faithful dog Lancer. What a true gentleman Ernie was. Always a smile and a kind word for everyone. Please accept our sincere condolences at this time. We will remember him in our prayers. I am so sorry to hear about the passing of your dear husband and send you and your family all my most sincere condolences and sympathy. Ernst is in a perfect place. Dear Ruth and family, so sorry to hear of Ernie’s passing. We always liked him so much.its been difficult for you in the past little while,may you all have peace of mind knowing he is at peace . Ruth, Jeanette and Family . So sorry for your loss . Ernie was such a gentleman. Loved to tell stories from his early life in Germany . He will be dearly missed by his family and all who knew him . You and the family are in our thoughts . Take care . Brenda and Jim the Barber ………..
Ruth, Jeanette and family – I am so sorry to hear of Ernie’s passing. You are in my thoughts and prayers. We are saddened to hear of Ernie’s passing. He was a great man. We are sure he will be missed by all who knew him. So sorry to hear of the passing of Ernie… Will miss his big smile. Hold on to your memories and it wont be long before he will be back with us better than every. The resurrection hope is so wonderful. May Jehovah strengthen you in your time of sorrow. we are so sorry to hear of Ernie’s passing. Take comfort in knowing he is no longer suffering, he is now at peace. So sorry to hear of Ernie’s passing. I had lots of good talks with Ernie when I was a boy growing up…..he truly was a fine man. You and your family are in our thoughts. Rob & Paula – Please accept my deepest sympathy on your loss. You will be in my prayers. We are so sorry for your loss. Our sympathy to your family. Our deep sympathy in the loss of a sweet man. Kurt and family, Japan also extend their condolences. We are so sorry to hear of Ernie’s passing and will continue to uphold you and your family in our prayers. You have our heartfelt sympathy. May God grant you comfort and peace of heart through this difficult time. I want to express my sincere condolences. Your family is in my thoughts and prayers at this difficult time. So sorry to hear of Ernie’s passing. I remember him well from my years at LRHS…he was a quiet man who always had a smile. My thoughts are with all of you at this time. Sorry to hear about Ernie,s passing. Our thoughts and prayers are with you all. Sorry to hear about Ernie’s passing…always enjoyed chatting with him after meetings and listening to his life story’s…rest in peace my friend. I was very sorry to hear of Ernie’s passing. It doesn’t seem that long ago since we were all in the Bowater Mersey band together. Whenever I saw him he had a smile on his face and was always pleased to catch up. You are in my thoughts and prayers. Ruth, I am so sorry to hear of Ernie’s passing. He was a wonderful man that always made me smile. My thoughts are with you at this time of loss. So sorry to hear of Ernie’s passing. I remember him from my days at LRHS. He was always smiling. Condolences to the family. Our deepest sympathy to Ruth and family in the loss of such a friendly and kind man. He will be missed by many. Take care of all your memories. Dear Ruth & family: I want to send you my condolences on the passing of Ernie. May all the prayers sent your way, give you comfort. I am thinking of you, and all your family. Sincerely Linda Leslie, Brooklyn. Very sorry to hear about Ernie. I worked with him when we first moved to the Junior High. He always looked after Tom Manley and I when we needed things for the gym. So sorry to hear about the loss of your father. May your memories of him warm your heart always.